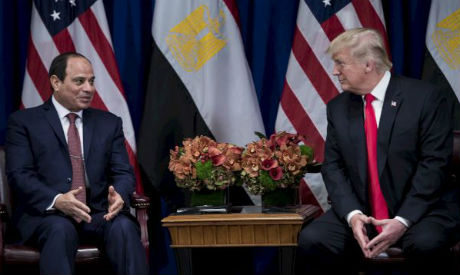 Cairo said on Saturday it hopes a meeting between President Abdel Fattah El-Sisi and US counterpart Donald Trump would mark a new level of relations to boost "Egypt's political and security capabilities." In statements reported by state run MENA news agency, Egypt's Foreign Minister Sameh Shoukry said on the sidelines of El-Sisi's visit to New York to attend the 73rd United Nations General Assembly (UNGA) that the meeting with Trump is of importance to strategic relations between both countries. This will be the first meeting between both leaders since Sisi won a second term unopposed in Egyptian presidential elections earlier this year. The last meeting between Sisi and Trump, who often show detectable signs of friendship during their talks, took place in September 2017, when the Egyptian leader was attending the 72nd session of the UNGA. Foreign minister Shoukry told journalists in New York that the resumption of joint military exercise with the US, "Bright Star 2018", was a proof of continued military cooperation between the two countries. He pointed out that Trump had recently agreed to release $195 in military aid which was withheld in 2016, adding that relations were moving on the right track. The US has been providing Egypt with foreign aid, including military assistance, since Cairo's 1979 peace deal with Israel. Each year, Egypt receives approximately $1.3 billion in US military aid, as well as an annual economic assistance package, which amounted to $150 million in 2016, according to the website of Egypt's foreign ministry. Shoukry also said that Egypt is currently in discussions with the US to work on the resumption of peace talks between Palestinians and Israelis, which have been stalled since 2014. "Egypt is also in talks with both the Palestinian and Israeli sides on the establishment of a Palestinian State with East Jerusalem as its capital," he added. Shoukry also spoke about the exchange of threats between US and Iran, saying that it was a matter to be dealt with only by the two concerned countries. "Egypt views this matter in light of the regional status and the importance of preserving national Arab security," he commented. El-Sisi, who left to New York on Friday, is set to deliver a statement to the UNGA next week, which will address Egypt's vision to enhance the role of the United Nations, according to the Egyptian Presidency. The Egyptian President will urge the world community to contain all armed conflicts, combat terrorism, push for denuclearization and tackle economic concerns. He is also set to meet with his French counterpart Emmanuel Macron, as well as other world leaders.